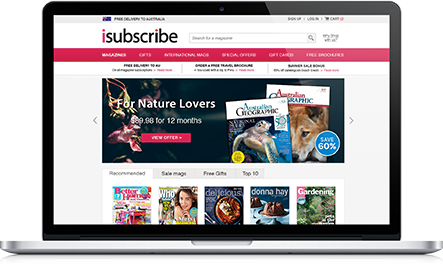 isubscribe is Australia's leading and most comprehensive online magazine subscription store with over 2,000 consumer, business, international and specialist titles on offer. Representing over 500 publishers, isubscribe has direct contractual relationships which means we offer the best prices and deliver the titles directly via Australia Post - saving time and money with up to 69% off retail prices. isubscribe offers a unique corporate subscription service that can be tailored to meet the specific needs of public, state and institutional libraries. With a dedicated account manager and a unique library website, isubscribe offers a centralised service to manage all your magazine and newspaper subscriptions. isubscribe currently services over 500 libraries globally, both tender and non-tender, and in some cases, on an ad-hoc basis. If you would like a free quote or have any other questions about the service, please email us at corporate@isubscribe.com.au or call us on 1300 303 619. To download an order form, click here. "I have found the corporate service of isubscribe to be most beneficial to use. The service is prompt, and follow up of any subscription issues is dealt with accordingly and with little fuss. It is great being able to contact just the one person with any subscription issues. New subscriptions ordered through isubscribe are actioned promptly with very few problems with the start up. I have used other online corporate magazine subscription services in the past and I have found them to be unhelpful and unresponsive, especially if they are not the publisher to the particular title I have requested to purchase or renew. isubscribe is by far the most efficient, and friendly service." "We have been using the isubscribe service for our magazine subscriptions for almost three years and in that time have been very pleased with the service provided. Our Corporate Account Manager responds to all our enquiries promptly and efficiently, whether it be for a quotation, invoice, renewal, or follow up on a missing issue. The liaison with the publishers is obviously effective as any problems with late or missing issues are resolved quickly and satisfactorily."